Bearcats Take Care of Business Against Orange...Trip to Orange May be in Their Future. It's a great time to be a BEARCATS fan! Even though the Bearcats had already clinched a BCS bowl berth, there sure was something special about Saturday (I think the picture to the left captures the fan atmosphere very well). The team finished decisively what they started by dispensing of an inferior Syracuse team to win, outright, the 2008 Big East Championship. Saturday was a day to celebrate a team comprised of 19 seniors who have endured losing seasons (4-7 in 2005), fleeing coaches (Dantonio), limited media exposure (2007 BE media day), and countless doubters (picked to finish 5th in BE this season). Saturday was a day to celebrate a team of 19 seniors that shocked the nation in a 2006 win over undefeated and then #7 ranked Rutgers (finished 7-5), only to turn around and adapt to a new coach and new system to win a school record 10 games the following season. This is a team that has captivated an entire city by bringing home a Big East Championship and becoming a Cincinnati sports story that ranks right up there with the 1992 UC Men's Basketball Final Four appearance, the 1990 Reds World Series and the '80 and '88 Super Bowls. Saturday was a day for the Bearcat faithful to celebrate a team they can't help but feel a personal connection to. These seniors are the founding fathers of a new era of UC Football excellence and a group that I am sure we will one day tell our children about in the context of how fortunate we all were to be along for the ride. Now the Cats are headed to their first ever BCS Bowl. Sugar or Orange, it doesn't matter; this is college football's biggest stage and UC is dancing on it. Unfortunately the accomplishment is shrouded in rumors of a possible Brian Kelly departure. The NeumannKy contemplated giving his opinion on the situation, but decided the topic is not for today's discussion. Until anything is official, Bearcats fans should focus on this week's game against Hawaii and how they plan on making it to the Bowl game. UC will have 17,000 tickets to sell and The NeumannKy is calling all Bearcats fans with the ways and means, to do their best to be a part of history! 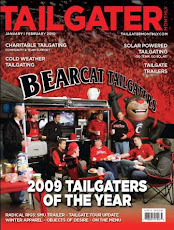 The folks at BearcatTailgater are saddened that the season has come and gone and that we have closed down the tailgate trailer for the last time of 2008. We'd like to thank everyone that has joined us on game days this season. WE WILL BE BACK NEXT SEASON BIGGER AND BETTER THAN EVER. We've got a lot of work ahead of us this offseason and some of the stuff we are talking about will literally blow your mind! I couldn't have written it better myself. Nicely Done!